Powerful sound technology, effective video features The Sony DAV-TZ145 Home Theatre System offers a complete multimedia experience thanks to the powerful sound technology and effective video features. This home theatre comes with a digital amplifier that delivers crisp and detailed sound while the HDMI output enables you to watch visuals in HD quality. This system includes one subwoofer and 5 speakers. To facilitate easy and comfortable navigation, this device has a remote control that allows you to alter the settings. It also has an FM radio feature which provides easy access to your favourite radio stations. The dedicated FM antenna captures signals effectively and offers seamless connectivity. The compact size and stylish design of this home theatre helps in saving space. High quality sound, Multiple format support The Sony home theatre is equipped with 360 Watt RMS that produces high quality sound and delivers accurate results. 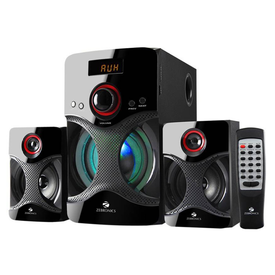 It comes with a subwoofer with output of 60 watts which facilitates enhanced bass. The console supports various video formats and enables you to access content in your preferred formats like JPEG, DVD and MP3. The video up scaling feature boosts the visual quality so that you get to enjoy detailed and sharp visuals while the 'On Screen Display' support helps in comfortable navigation and usage. The Dolby Digital feature enhances the overall sound quality while the Dolby Pro Logic technology generates loud audio in an equally effective manner. Digital amplifier, effective processing technology This Sony home theatre is equipped with cutting edge sound technology that allows you to experience theatre like sound at your home. This system comes with a digital amplifier which uses advanced amplifying technology that helps in enhancing sound output. This amplifier does not change digital signals into analogue mode while converting them; thus leading to natural sound without any distortion. It also has effective 'signal balancing and separating' feature that facilitates sound accuracy. The S-Master Amplifier uses power effectively and helps in reducing the heat production. Hence, there are no strains on the system even after extended period of usage. The superior data processing technology of this home theatre transforms the inferior quality of old movies into clear and crisp visuals. HDMI port and other connectivity options with Bravia This home theatre is armed with an HDMI feature that enables you to watch visuals in HD quality and enjoy enhanced multimedia. Through the HDMI port, you can connect this home theatre to an external screen and watch contents in superior quality with detailing and vivid colours. You can also connect this system with a Bravia television. It comes with a dedicated button 'Bravia connection' which is easily accessible on the remote control. Powerful sound technology, effective video features The Sony DAV-TZ145 Home Theatre System offers a complete multimedia experience thanks to the powerful sound technology and effective video features. This home theatre comes with a digital amplifier that delivers crisp and detailed sound while the HDMI output enables you to watch visuals in HD quality. This system includes one subwoofer and 5 speakers. To facilitate easy and comfortable navigation, this device has a remote control that allows you to alter the settings. It also has an FM radio feature which provides easy access to your favourite radio stations. The dedicated FM antenna captures signals effectively and offers seamless connectivity. The compact size and stylish design of this home theatre helps in saving space. 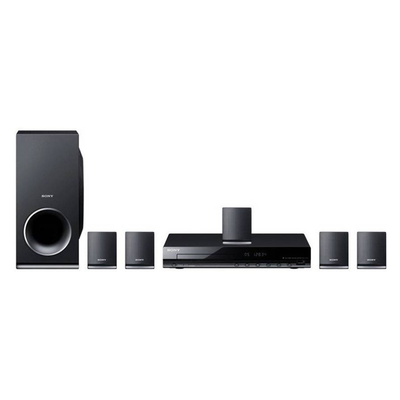 High quality sound, Multiple format support The Sony home theatre is equipped with 360 Watt RMS that produces high quality sound and delivers accurate results. It comes with a subwoofer with output of 60 watts which facilitates enhanced bass. The console supports various video formats and enables you to access content in your preferred formats like JPEG, DVD and MP3. The video up scaling feature boosts the visual quality so that you get to enjoy detailed and sharp visuals while the 'On Screen Display' support helps in comfortable navigation and usage. The Dolby Digital feature enhances the overall sound quality while the Dolby Pro Logic technology generates loud audio in an equally effective manner. Digital amplifier, effective processing technology This Sony home theatre is equipped with cutting edge sound technology that allows you to experience theatre like sound at your home. This system comes with a digital amplifier which uses advanced amplifying technology that helps in enhancing sound output. This amplifier does not change digital signals into analogue mode while converting them; thus leading to natural sound without any distortion. It also has effective 'signal balancing and separating' feature that facilitates sound accuracy. The S-Master Amplifier uses power effectively and helps in reducing the heat production. Hence, there are no strains on the system even after extended period of usage. The superior data processing technology of this home theatre transforms the inferior quality of old movies into clear and crisp visuals. HDMI port and other connectivity options with Bravia This home theatre is armed with an HDMI feature that enables you to watch visuals in HD quality and enjoy enhanced multimedia. Through the HDMI port, you can connect this home theatre to an external screen and watch contents in superior quality with detailing and vivid colours. You can also connect this system with a Bravia television. It comes with a dedicated button 'Bravia connection' which is easily accessible on the remote control.